*Note: The same does NOT hold true for Newcastle in a bottle. For reasons no one seems to quite understand, Newcastle is bottled in clear glass. Since light is the worst offender when it comes to beer spoilage, Newcastle is generally considered the most frequently “skunked” beer in the history of ever. In yet another sign that the macros are getting a little frightened by the inexorable growth of craft breweries and the resultant weakening of Big Beer’s hegemony, the Newcastle brand will now be added to a seasonal line-up of beers. The Summer Ale was actually introduced last year, and this year a Winter IPA will also be added to the stable of Newcastle brews. 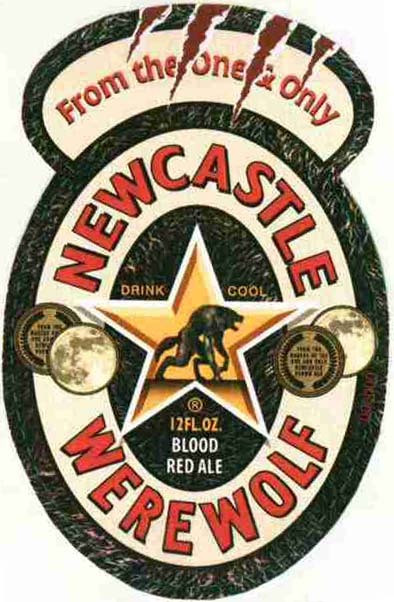 But by far my favorite addition is the Newcastle Werewolf…a “Blood Red Ale” that will be released in the Fall. Everything about this is ridiculous. I can understand the introduction of a Summer and Winter ale to the Newcastle brand. Newcastle is a huge name with a loyal army of drinkers and adding a basic Summer and Winter seasonal just makes sense. I even back the fact that the Winter is an IPA…not usually a traditional Winter style. But a Fall beer called the Werewolf? That’s just absurd. And a “blood” red ale? What’s appetizing about that? Just look at the labels. The Summer Ale has a powder blue color scheme with a red and yellow summer field instead of the blue Newcastle-upon-Tyne star. Looks good. The Winter IPA has dark blue graphics with a snow-covered evergreen in the star. Fine by me. But the Werewolf label? It has a “fur” background with a loping lycanthrope in the star AND fake “claw marks” across the top. I honestly have no idea what to make of this. I’m hopeful that it’s just another kink in the armor of Big Beer and that we are witnessing the beginning of the decline of the macros. I’m sure I’m wrong as always, but a boy can dream. And right now, I’m dreaming of snarling, bloodthirsty werewolves metaphorically slaughtering the minions of Big Beer to clear the way for a glorious new era of thoughtful, tasty craft beer. Posted in Beer Marketing.Tagged Brown Ale, Newcastle, Summer Ale, Werewolf, Winter IPA. I predict I will drink a single Newcastle Werewolf. No more, no less. I predict I will drink one just to acquire the label for my collection of oddities. Hmmm… Troeg’s Mad Elf is pretty damn red. Funny in writing but is okay to point out that this is post about label? Maybe Boorley you next time post about bottle-cap or how many tabs you pull off of Oskar cans without breaking it? Is it sad that Aleheads now has an “in-house troll”? I believe with the addition of the Czar, our little website has officially jumped the shark. I have Svetlana look that up. I belief I am penetrating with powerful commentary here. My first real post perhaps must to be refutation of your slander of the Sierra Nevada Glissade which is better than you thinks.